Issued each Monday, FYI This Week highlights upcoming science policy events and summarizes news from the past week. 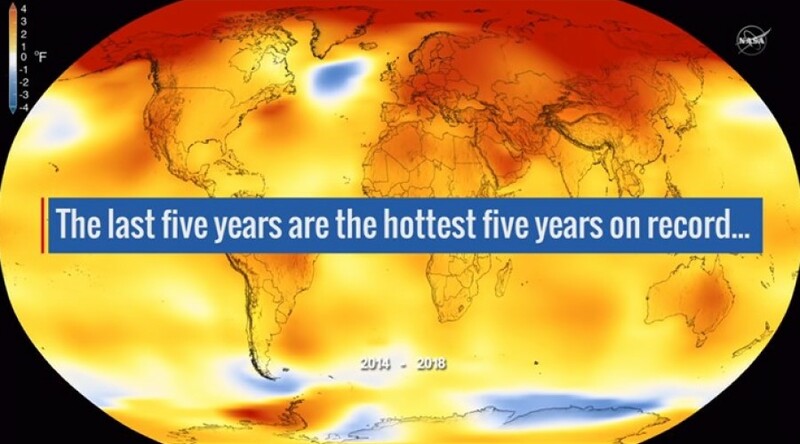 NASA and the National Oceanic and Atmospheric Administration announced last week that 2018 was the fourth warmest year since 1880, as measured by average global surface temperature. On Wednesday, the House Science Committee is dedicating its first hearing of the year to discussing “the state of climate science and why it matters.” Committee Chair Eddie Bernice Johnson (D-TX) has said one of her top priorities for the new Congress is to tackle the problem of climate change, “starting with acknowledging it is real, seeking to understand what climate science is telling us, and working to understand the ways we can mitigate it.” All five witnesses are climate scientists, two of whom were co-authors of the Fourth National Climate Assessment: Kristie Ebi, who directs the Center for Health and the Global Environment at the University of Washington, and Robert Kopp, director of the Rutgers Institute of Earth, Ocean, and Atmospheric Sciences. Also appearing are Woods Hole Research Center scientist Jennifer Francis and Natalie Mahowald, faculty director for the environment at the Cornell University Atkinson Center for a Sustainable Future. The Republican-invited witness is Joseph Majkut, director of climate policy at the Niskanen Center. The stopgap spending measure that ended the 35-day partial government shutdown last month is set to expire on Friday. Negotiations on a compromise border security package have stalled, raising the prospect of another shutdown, though it is possible that lawmakers could extend the stopgap measure to buy more timeWhite House officials have reportedly signaled that President Trump would be open to signing such a measure. The National Science Board is meeting Tuesday at the National Science Foundation’s headquarters in Alexandria, Virginia. In the public portion of the meeting, the board will hear a plenary talk on “American Business Innovation” by Chris Liddell, who is deputy chief of staff for policy coordination at the White House. In a separate plenary session, two former board members — physicist Barry Barish and former Director of Defense Research and Engineering Anita Jones — will share their views on “future challenges and opportunities for the U.S. science and engineering enterprise.” The board will also discuss a summary document on “foreign born students and workers in the U.S. S&E enterprise,” which it produced in response to broad interest in the topic. The American Astronomical Society will hold webinars this week to make up for the cancellation of two agency town hall meetings at its January meeting due to the government shutdown. On Wednesday, officials from NASA’s Science Mission Directorate will discuss the status of Astrophysics Division programs, planning for the upcoming decadal survey, and upcoming grant and mission proposal opportunities. On Friday, the director of the National Science Foundation’s Astronomical Sciences Division will provide updates on facilities and grant programs, the division budget, and engagement with the research community. The annual meeting of the American Association for the Advancement of Science is convening this week in Washington, D.C. With the theme of “science transcending boundaries,” the meeting will explore how science can “help address the many divisions in our communities, in global society, and in science itself.” The meeting will feature plenary sessions with high-level officials from government science agencies from around the world. Fabiola Gianotti, the director-general of European Organization for Nuclear Research (CERN), will speak on the role of international collaboration at the organization. In conjunction with the meeting, AAAS is also hosting back-to-back science policy networking events on Saturday. UPDATE: On Friday, Kelvin Droegemeier will make his debut appearance as director of the White House Office of Science and Technology Policy at a newly announced special session, which will be webcast. 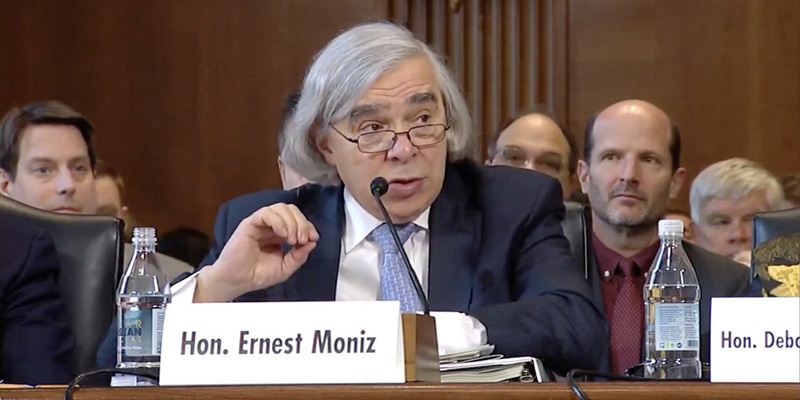 Ernest Moniz, Secretary of Energy during the Obama administration, testifies at a hearing last week on energy innovation. At two hearings on Feb. 6, lawmakers from both parties pointed to supporting “innovation” as a primary way in which the federal government should respond to climate change. Rep. Paul Tonko (D-NY), who chairs the Environment Subcommittee of the House Energy and Commerce Committee, called climate change “this generation’s Sputnik moment,” calling for a “moonshot” effort to address the problem. Rep. Greg Walden (R-OR), the committee’s top Republican, said his caucus is “focused on solutions that prioritize adaptation, innovation, and conservation. ... we want America’s innovators to develop the next technologies that will improve the environment and create jobs here at home.” House Natural Resources Committee Chair Raul Grijalva (D-AZ) called for a broader approach, saying that “we know that we need more than innovation, we need good policies.” However, Republican lawmakers are criticizing the recent “Green New Deal” proposal backed by many Democrats, including Grijalva, that calls for a sweeping transformation of the U.S. energy system and major economic reforms. The Department of Energy plans to restrict its employees and grantees from collaborating with foreign nationals from countries it deems “sensitive,” according to an internal memorandum obtained by ScienceInsider last week. Issued late last year by Deputy Energy Secretary Dan Brouillette, the memo establishes an advisory board responsible for developing and updating a science and technology “risk matrix” that lists the sensitive countries on one axis and certain “emerging research areas and technologies” on the other. DOE employees and grantees working in these areas will generally be “prohibited” from collaborating with individuals from the corresponding countries on the matrix, though the department can grant exceptions on a case-by-case basis and for certain categories of engagement, such as government-to-government agreements. Under Secretary for Science Paul Dabbar, who is responsible for fleshing out the policy with the department’s other under secretaries, told ScienceInsider that DOE employees will be forced to resign and grantees will lose the ability to compete for DOE grants if they do not comply with the policy. In a related move, DOE issued a separate memorandum last month that prohibits its employees and grantees from participating in foreign talent recruitment programs operated by “sensitive” countries. House Science Committee Ranking Member Frank Lucas (R-OK) revealed the Republicans’ subcommittee leadership assignments last week at the committee’s first business meeting of the new Congress. Two of the party’s most active committee members, Reps. Randy Weber (R-TX) and Brian Babin (R-TX), are remaining as the top Republicans on the Energy Subcommittee and Space and Aeronautics Subcommittee, respectively. Rep. Roger Marshall (R-KS) is taking over from Rep. Andy Biggs (R-AZ) as top Republican on the Environment Subcommittee. Rep. Ralph Norman (R-SC) is now ranking member of the Oversight and Investigations Subcommittee, taking the slot previously held by Rep. Ralph Abraham (R-LA), who has left the committee. The ranking member of the Research and Technology Subcommittee is Rep. Jim Baird (R-IN), who is new to Congress. Baird previously served as a representative in the Indiana General Assembly. However, he began his career as a livestock specialist with the Purdue University Cooperative Extension Service after earning a doctorate in animal science monogastric nutrition from the University of Kentucky in 1975. The subcommittee’s former chair was Rep. Barbara Comstock (R-VA), who lost her seat in the November election. The Senate Energy and Natural Resources Committee released the membership rosters for its four subcommittees last week. Sen. Bill Cassidy (R-LA) is the new chair of the Energy Subcommittee, which has jurisdiction over the Department of Energy. The former chair, Sen. Cory Gardner (R-CO), now chairs the Science, Oceans, Fisheries, and Weather Subcommittee of the Senate Commerce, Science, and Transportation Committee. Sen. Martin Heinrich (D-NM) is the Energy Subcommittee’s ranking member, taking over from Sen. Joe Manchin (D-WV), who now chairs the full committee. A vocal advocate for the nuclear security laboratories in his state, Heinrich is also ranking member of the Strategic Forces Subcommittee of the Senate Armed Services Committee, which has jurisdiction over the nation’s nuclear weapons complex. Last week, the House Intelligence Committee announced it has reorganized and that its new structure includes a subcommittee dedicated to “strategic technologies and advanced research.” The panel will oversee the “development and implementation of emerging and advanced technologies that are essential to intelligence collection and national security” and work to ensure the U.S. “remains at the cutting edge in overhead systems, artificial intelligence/machine learning and computing, as well as data and systems integrity.” Reps. Jim Himes (D-CT) and Chris Stewart (R-UT) will serve as the subcommittee’s chair and ranking member, respectively. Previously, technological issues were subsumed within an Emerging Threats Subcommittee that has been eliminated in the new structure. In his third state of the union address, President Trump made a brief reference to supporting “cutting-edge industries of the future” as a part of potential infrastructure legislation. Shortly after the speech, the White House Office of Science and Technology Policy issued a statement identifying artificial intelligence, advanced manufacturing, quantum information science, and next-generation wireless communication technology as examples of such industries. The administration is planning to take actions in support of these technology areas in the coming months. Trump is expected to sign an executive order imminently to establish a national AI initiative. In his address, Trump also called for increased investments in health R&D to cure HIV and childhood cancers. President Trump announced on Feb. 4 that he plans to nominate Acting Interior Secretary David Bernhardt to lead the department, succeeding former Secretary Ryan Zinke. Republican senators have expressed support for Bernhardt’s nomination, though he may face opposition from Democrats due to his prior work as a lobbyist for industries regulated by the department. While serving as deputy secretary under Zinke, Bernhardt issued an “open science” directive that echoes a similar, controversial proposal awaiting final action at the EPA. The National Academies released two short reports on Feb. 7, evaluating the scientific components of NASA’s new lunar exploration campaign. One of the reports verifies that NASA’s plans align with the scientific priorities for lunar science set out in the most recent National Academies decadal survey for planetary science. However, it states those plans should not be regarded as a replacement for the mid-scale projects that the survey recommended: the Lunar South Pole-Aitken Basin Sample Return mission and the Lunar Geophysical Network. The report recommends the new activities should still be formally evaluated within the context of NASA’s planetary science program by the next decadal survey, which is due for release in 2022. The second report concentrates on NASA’s plans to integrate lunar science with commercial services. While it finds commercial landers could provide valuable scientific results, it warns the “interfaces” between scientific instrumentation and such landers remain “undefined,” which could lead to program delays. On Feb. 8, the National Academies released a report surveying the current status of materials research in the U.S. and identifying promising areas for work in the coming decade. Among its recommendations, it calls on the federal government to develop a national strategy for ensuring stakeholders can access and develop midscale instruments and laboratory infrastructure, such as materials growth facilities and helium recycling systems. It also recommends that agencies sustain and “in some cases” increase support for fundamental research in “long-established” materials research fields, while reinforcing newer R&D efforts in additive manufacturing, quantum materials science and engineering, and the application of “computational methods, data analytics, machine learning, and deep learning” to materials research. Unlike some other decadal surveys, the report does not rank research priorities. The survey was co-chaired by National High Magnetic Field Laboratory Chief Scientist Laura Greene, University of Pennsylvania physicist Tom Lubensky, and Matt Tirrell, Argonne National Laboratory’s deputy director for science. The three will discuss the survey’s findings and recommendations in a webinar on Feb. 28. NASA Science Mission Directorate head Thomas Zurbuchen hosted a virtual town hall event on Feb. 7 to update the community on NASA programs following the recent partial government shutdown. Zurbuchen said the agency's immediate priorities include supporting their workers, eliminating confusion over deadlines, and expediting timelines for returning to normal operations. Regarding NASA missions, he said, “some milestones may be delayed, but there are no significant changes to launch readiness dates.” He also reported that proposal deadlines, including for the Research Opportunities in Earth and Space Science (ROSES-18), NASA’s annual general solicitation for basic and applied research proposals, will be no earlier than to March 29 in most cases. Slides and audio from the town hall are available here. All times are Eastern Standard Time and all congressional hearings are webcast, unless otherwise noted. Listings do not imply endorsement. National Academies: "STEM Education Day"
UMD: "Science and National Security"
SETI: "The Future of NASA Space Telescopes – What to Look for in the Next Generation"
Know of an upcoming science policy event? Email us at fyi@aip.org. The Information Technology and Innovation Foundation is hiring a senior policy analyst for its clean energy innovation program. The analyst will assess policies that “have the potential to influence the national and global transition to a low-carbon energy system, such as research, development, and demonstration funding, taxation, and regulation.” Applicants must have a graduate degree in a relevant field and at least three years of relevant experience. The American Meteorological Society is holding its Washington Forum in D.C. on March 27 through 29. The annual event brings together scientists and top federal officials to discuss policy issues related to the weather, water, and climate sciences. This year’s forum includes sessions on hurricane resiliency, the value of weather information, “smart farming,” and applications of artificial intelligence in the weather industry. The American Geosciences Institute is accepting applications for its summer policy internship programs. Applicants must be undergraduate or early-stage graduate students in the geosciences or a geo-related engineering field. Applications are due March 1. Know of an upcoming science policy opportunity? Email us at fyi@aip.org. News and views currently in circulation. Links do not imply endorsement.